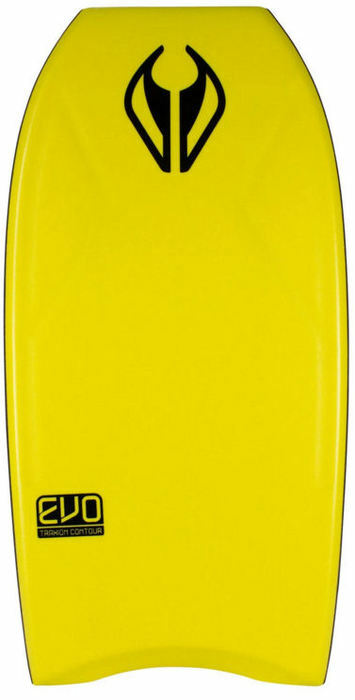 4	stars -	"Review for NMD Evolution PE Yellow" Mark Taylor This NMD Evolution PE Yellow is the best Boards Body I have tried. More features than a Swiss Army Knife, the Evolution has it all. A functional Traxion deck contour on top, beefed up with double EXT stringers in the middle and a React Mesh layer down below. The volume has been dialect in at each length to give you float without bloat. Hand finished to mez's exacting specifications so you knows it good. FEATURES: Soft Flex, Wider Nose Width, Shorter Rail, Curved Templates, PE Core, Double Stinger.